A respite has come, after weeks in which the oppressive cold has filled me with the overwhelming urge to make a hot water bottle and take to my bed at three in the afternoon, I woke before dawn this morning, restless with thoughts and plans. Walking up the road to the market early, I discovered that now the snow is gone the puddle under the railway bridge is back, so I had to wait for a gap in the traffic and sprint under the bridge to avoid getting drenched by a wave of spray from a passing car. The first thing I saw at the market were Daffodils from Lincolnshire and from Cornwall, and although there were only a fraction of the stallholders and as yet no customers, there was a prevailing atmosphere of optimism. “It’s not raining and it’s not cold , no excuses this week!” I heard one stallholder declare in expectation of a healthy day’s trading. To celebrate this change in the weather, I bought cut flowers, these Narcissi from Tremelethen Farm, St Mary’s in the Scilly Isles, three bunches for £2. Their heavenly scent will fill my small drawing room and remind me that there are warmer climes where Spring is happening already. …….thankyou for your brilliant posts which i’ve recently discovered,today’s flowers are beautiful,i really love the way that with narcissus the greens and yellows fuse so fantastically that it’s very difficult to get right in paint (for me,at least). I hope all is well,please keep posting and we’ll keep enjoying,although i can’t really envisage me being around to savour the 10,000th. Sounds like you’re having a thaw! I peered closely at the daffs at my local Trader Joe’s this week wondering if they could…be…. from the Scilly Isles. But no. They are “local”. Amazingly, (I don’t know why, maybe cause I’m living in a “desert”? – L.A.) the narcissi are sprouting up on the sides of the road alongside bearded iris. 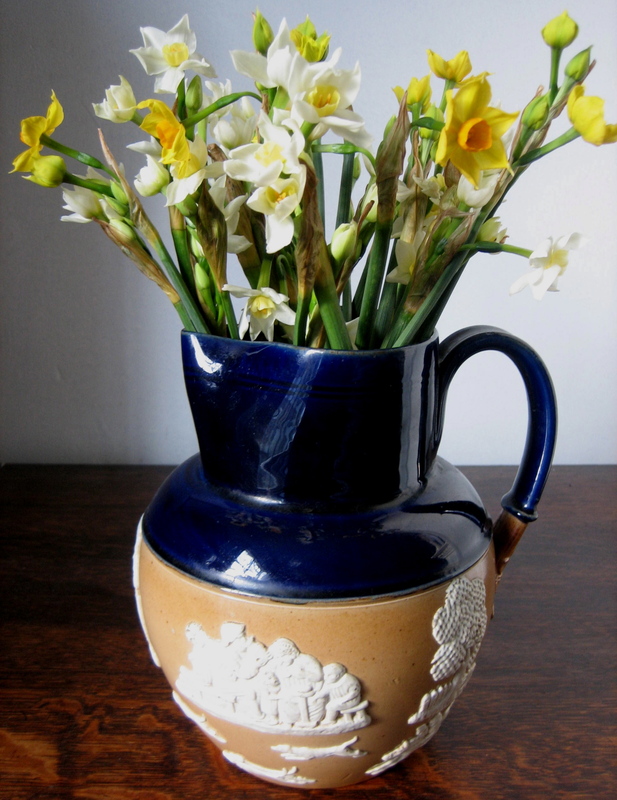 (And it really is “exhalations” that come from narcissi, aren’t they?) Anyway, wherever we are, it’s good to know that spring is on the way. Still though! At 3 bunches for two pounds I’d buy them even if I had bunches shooting up in the yard! I fear that it is bad for me to read your Sunday morning posts because I am always consumed with desire to go out and purchase whatever flower is featured. Alas, no Columbia Road market nearby for me. They look gorgeous, I much prefer these with small heads as well as the miniature varieties. Still, anything is welcome at the moment . Snow all gone but more forecast for Wednesday. Roll on Spring.